Some of my favorite gifts to give are ones that help give back to others. I think it makes the gift extra special and gives a story for you to tell the recipient! 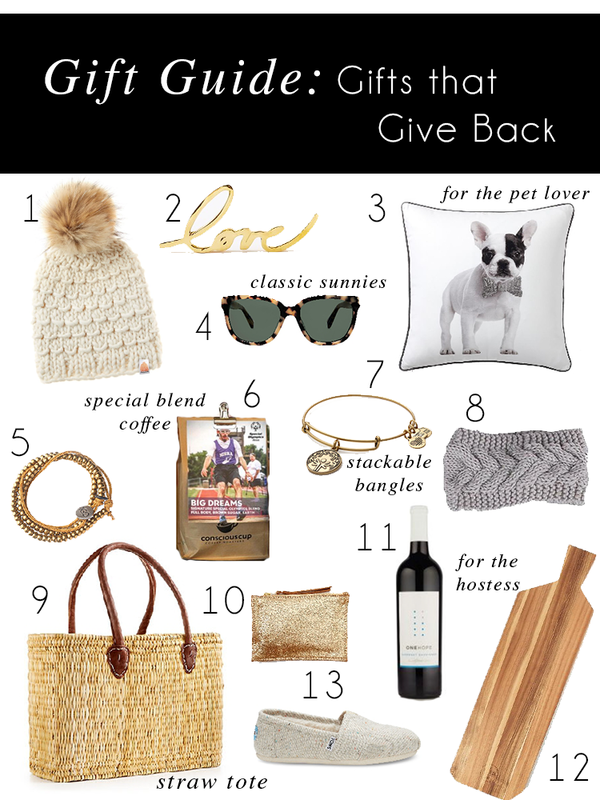 When I started to look for gifts to include in this guide, I was amazed at how many retailers that had entire sections of their website dedicated to charitable gifts. I first heard one the company who makes these cozy beanies while we were living in Boston. In addition to having one of the best names I've ever heard, Sh*t that I Knit, is a company of young knitters who not only love to knit, but love to give back. With every purchase they provide a knit kit to a young adult undergoing cancer treatment! Warby Parker and Toms are are more well known charitable companies that give a pair of glasses or shoes to a person in need for every pair purchased. My pair of Toms are my go to shoes when I know I have a lot of walking to do or if I'm running out to do some errands and my Warby Parker sunnies are my favorite pair because they have prescription lenses! Because they offer so many different styles I think anything from these two companies would make great gifts for anyone on your list! I love trying out new coffee and this blend is extra special to me because it benefits Special Olympics Illinois. Some of you may know that I've volunteered with Special Olympics in some way shape or form for the majority of my life. It's an organization that I am very passionate about and wanted to share with all of you an easy (and delicious!) way to help all the amazing athletes. In addition to the coffee blend, the volunteer board that I am a member of is hosting a party next Thursday featuring the coffee at Conscious Cup, the coffee shop who is making the blend. If you're local to the Chicagoland area I would love to see you there! You can purchase coffee or tickets or both at the link. One of my favorite finds this year was the 100 Good Deeds bracelet. Hand-made by women throughout the world, this bracelet is meant to be a visual reminder to serving others and changing the world, one good deed at a time! Keeping with the jewelry trend is another one of my favorites, Alex & Ani bracelets. They're great for stacking with other bracelets or by themselves and they have a huge collection of bracelets that give back. If you're looking for a great hostess gift that will also serve as a conversation starter at your holiday parities, #11 and #12 are perfect for just that. Each product from One Hope gives back to a different charity from animals to cancer research to literacy so you can indulge while doing good! To compliment the bottle of wine, this pretty serving board is great for the entertainer or cook on your list and will actually provide 23 meals to families in need in the US through FEED. I hope you find something in this gift guide that inspires you to shop for something with a little extra meaning this holiday season! If you have any favorite gifts that give back, I'd love to hear about them!